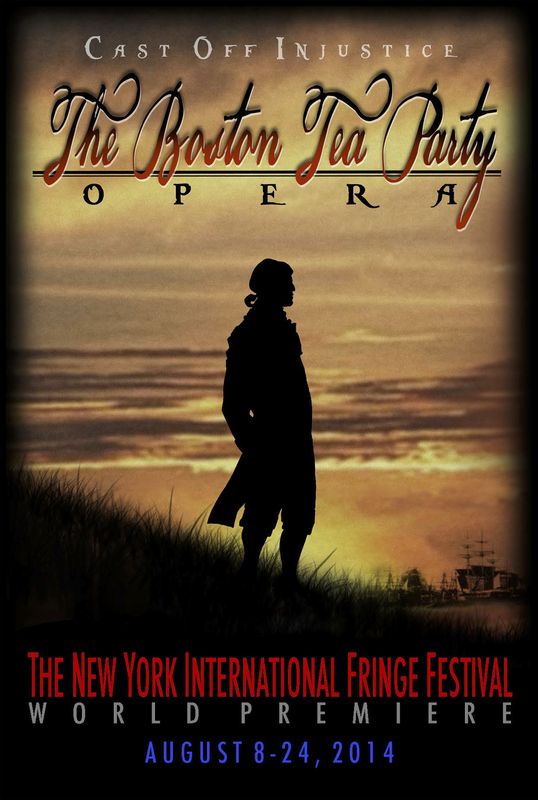 The New York International Fringe Festival this summer includes a new opera by Matthew Zachary Johnson: The Boston Tea Party Opera. (Final performance Friday, August 22 at 5:15pm at the Sheen Center on Bleecker St.) This show marks a new direction in his work. Johnson is the composer of a body of often-performed classical saxophone works. His debut recital in 2006 led to the album "Saxophone Music of M. Zachary Johnson: Live at Steinway Hall." His subsequent works were presented at Carnegie Hall's Weill Recital Hall and the Glimmerglass Opera's Young Artist recital series. He served as Composer in Residence of the 2007 Austin Peay State University Governor's Honor Band Festival, and founded The MZJ Ensemble, a symphonic group based in New York City which performed his larger compositions. The recipient of numerous annual ASCAPlus awards, he serves on the faculty of Mannes College the New School for Music. Johnson presented his first musical theater piece, The Boston Tea Party opera during this year's International Fringe Festival (FringeNYC), where over 200 international companies perform for 16 days in more than 20 venues. The largest multi-arts festival in North America is now in its 18th year and attracts over 75,000 attendees annually. I interviewed Johnson about the Boston Tea Party Opera. What was your inspiration for the opera? I first had the idea for the show a little over three years ago. It was the news headlines that got me thinking about the founding of our country and the iconic Boston Tea Party. When I imagined that event, it struck me as so dramatic and rich in meaning; I thought "somebody should write an opera about that!" Then I paused and though, "Hey wait a minute, I should write an opera about that!" How did you decide to include so much imagery? Before this show, I had been a composer of instrumental music -- a lot of saxophone music and ensemble music -- plus a few songs here and there. For the Boston Tea Party Opera I did historical research and selected events that would work well on the stage. I developed a vivid, dramatic picture in mind for each scene. Mine was a mythic-modern take on the historic events, so a certain amount of abstract poetry was necessary in the visuals, most especially in the choreography. Is this your first foray into dance? Yes. I'm not much of a dancer myself, but I knew I wanted choreography to be a significant part of the show. I was delighted to bring Karen Gayle on board as the choreographer. She is, frankly, a genius with movement. She tells a clear story through movement, and always does it in her own distinctive and original way. I give her broad suggestions, and then she'll come to me with something totally unexpected, something that just works perfectly and expands the show beyond what I thought it could have been. How does The Boston Tea Party parallel politics today? Headline concerns today include the militarization of police and the use of unlimited search warrants. These are two of the issues raised by the Boston Tea Party Opera. In 1760 attorney James Otis gave a passionate courtroom speech against the "Writs of Assistance" -- basically the 18th-century equivalent of the Patriot Act -- and John Adams remarked "the child independence was then and there born." Just imagine what James Otis would say if he heard the loop announcement on the subway that "bags and packages are subject to random search"! What draws you to opera? That's easy -- it's the emotional power! Please tell me about the state of indie theater. The big challenge these days is the underlying costs, which mostly have to do with the cost of real estate. Getting space to perform and rehearse in has gotten very expensive. So we have to be pretty inventive and flexible in order to make a show happen. I've really enjoyed the whole creative process and there are several standouts for me: the drama of the Boston Massacre, which is the end of the first Act of the show; the romantic duets; the comic song "Religious Compliance"; if I had to choose just one, for somewhat sentimental reasons, it would be the little satire of King George having tea, which opens the show. This was the first thing we worked on in rehearsals so it was my first chance to really see my vision come to life. Karen Gayle, the choreographer, was right there with me and we were shaping the scene together -- and then, as audience members, we were laughing out loud at the satire! How did you enjoy collaborating with your wife, Jocelyn? Did she have a lot of influence on the final product? My wife is wonderful and contributed to the show in myriad ways. Of course, she's been responding to the show, and giving me feedback, for the whole process of composing and developing it, not just the recent rehearsal process for the premiere at the Fringe Festival. So her influence goes way back to the beginning. She helped with concepts, props and costumes. She very tactfully mentioned to me spots in the show that were too long or not making sense. She advised me on how to handle people. She gave me pep talks when I was having a rough time. Definitely couldn't have done it without her. If you can believe it, I've already started drafting three new musicals. One is about academia, one is about bandits in the wild west, and one is about women. I just have to decide which one to move forward on first!